Think thin bacon strips with meaty flavors and just the right amount of salt that you can fry into crunchy strips--it's clearly the stuff bacon dreams are made of. 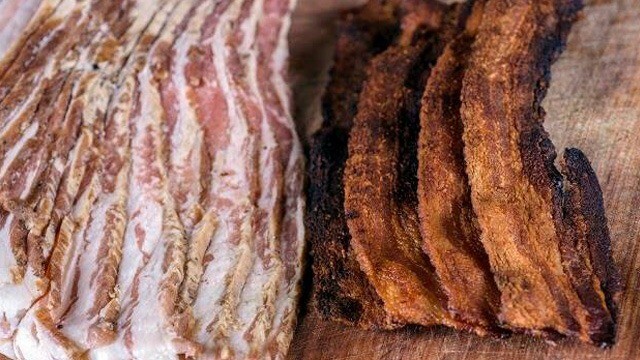 You can actually have bacon delivered to your home every month with Smoke'n Sweets' bacon subscription service. "When I started smoking meats, I had always wanted to have some sort of subscription similar to what many businesses offer in the States. Jam, beer, fruit, cheesecake of-the-month subscriptions were a popular thing, shared Smoke'n Sweets Jack Ruivivar, who fancies calling himself a "bacon man." "So I developed a model I thought might work here. The first bacon subscriptions started going out for delivery in November of 2016. In May of 2017, I offered a six-month subscription for new subscribers and existing subscribers. About half of those at the 500 gram level did add to their subscription. How exactly does the bacon subscription work? You may choose to have 500 grams (one-time payment of Php4,500) or 1 kilo (one-time payment of Php8,000) of Smoke'n Sweets bacon delivered to your home every month. Payment options include bank deposit, cash, or via Bitcoin. Smoke'n Sweets current subscription rate is their "Pre-Ber promo" designed for subscription renewals or new subscribers. Meats are sourced from Europe and Smoke'n Sweets supplies organic bacon to Margarita Fores' Grace Park restaurant, a testament to the quality of the bacon they supply. The current subscription promo price allows for gifting which means you may have them sent to someone who loves bacon. You may also split or "share" the subscription. Ruivivar explains, "Two people sharing the payment for one kilo and can either alternate months or each one may get half a kilo of bacon every month." Find Smoke'n Sweets on Facebook or mesage them at 0908-3680430. You can also find Smoke'n Sweets at Sidcor Sunday Market, Eton Centris, EDSA, Quezon City. Would You Invest Php2M-Php3.5M in a Franchised Stall of Kris Aquino’s Nacho Bimby?